“Hi Ho Silver, Away!”, “ Hey Kids What Time Is It?” , “Lucy! You got some ‘splainin’ to do!”, “Baby you’re the greatest”, famous 50’s TV catch phrases all – and lastly “the” one classic catch phrase that is ever so timeless – “Say goodnight, Gracie”! “The George Burns And Gracie Allen Show” ruled the airwaves from 1950 to 1958, from vaudeville, to radio and then on to television they were comedy royalty. In this most turbulent world- when we crave a hearty laugh where are Gracie and George when we need them now you ask? Well calling all G & G fans be they “Natty-ettes” (George was born Nathan Birnbaum) and Googie-Cats (what George called Gracie) – let’s grab a can of Carnation’s evaporated milk and head over to the Seven Angels Theater in Waterbury, Connecticut as they present an endearing and oh so exhilarating tribute to a most beloved husband and wife team and their classic situation comedy – “George and Gracie: Part 2” starring Semina De Laurentis as “Gracie” and R. Bruce Connelly as “George”. 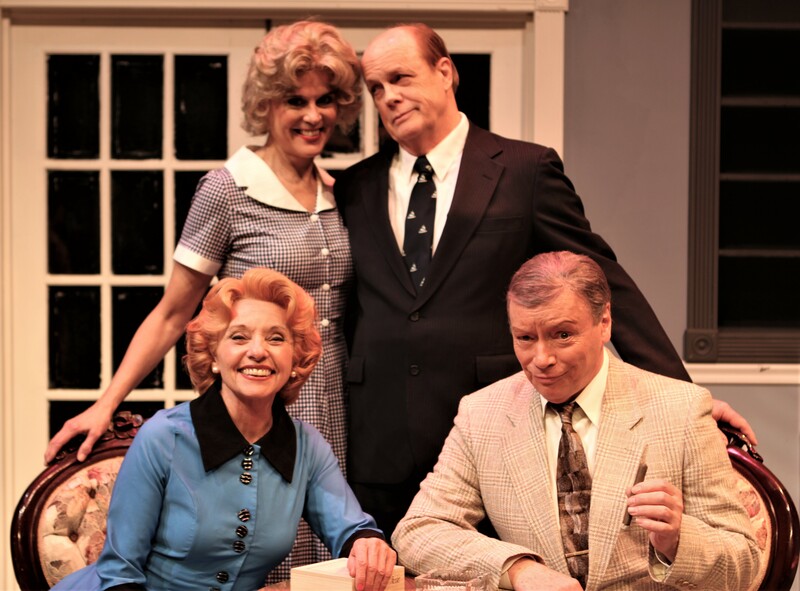 Top- Blanche (Sarah Knapp) and Harry Morton (John Swanson), bottom- Semina De Laurentis as Gracie and R. Bruce Connelly as George. I freely admit I am not a TV child from the golden age of television (1950’s ) but that of the silver – 60-70’s – in fact my hair has even taken on a silver screen tinge – as a child I devoured old tv shows – thank Heaven for reruns. I can still from memory recite an entire Sunday’s listing of CBS programming – 7pm, Lassie, 7:30, Dennis the Menace, 8pm The Ed Sullivan Show, 9pm, The Smothers Brothers, 10pm, Candid Camera and at 10:30 What’s My Line. As an early connoisseur of Television- I so recall watching George, sans Gracie, as “today’s guest star” – George Burns – on the “Lucy Show”, “Jack Benny” Holiday specials and those suave “celebrity roasts” hosted by Dean Martin as he joked, kibitzed, and did a mean soft-shoe. Yet it was during the ‘50’s that George and Gracie ruled the airwaves – by the way though Gracie was the real star – George always got top billing. The TV GUIDE schedule- 8pm Monday night on CBS, – Now don’t turn that knob!! I can hear their opening theme “Love Nest” playing, and I think I can smell George puff away on one of his El Producto cigars. Now let’s enter the Burn’s home located at 312 Maple Drive in “the” Beverly Hills, California where we are introduced to their neighbors Blanche (Sarah Knapp) and Harry Morton (John Swanson), and announcer Harry Von Zell (Tom Chute). Alike the Seinfeld Show, “The George Burns and Gracie Allen Show” was literally about nothing- each week George would saunter out from the curtain, look directly at the camera, “breaking that fourth wall”, slowly puff on his cigar, and tell us what strange and deliciously ditsy dilemma wife Gracie had gotten herself into. And that’s it for 30 minutes- after that it was ALL Gracie! This production painstakingly recreates several of these classic television episodes including: “Gracie Goes to Psychiatrist for Blanche’s Dream” (season 4 episode 23 (1954) Gracie consults a psychiatrist to help Blanche understand her dream of drowning by her husband Harry and “Gracie Writes ‘My Life with George Burns” – (Season 3 episode 10 (1952) “Gracie fabricates a magazine article claiming George once beat up an infamous gangster who shows up at the Burns home in a very bad mood. The finale even includes an “after piece” of one of their vaudeville shows highlighting the likes of Sophie Tucker and other stars of the period. 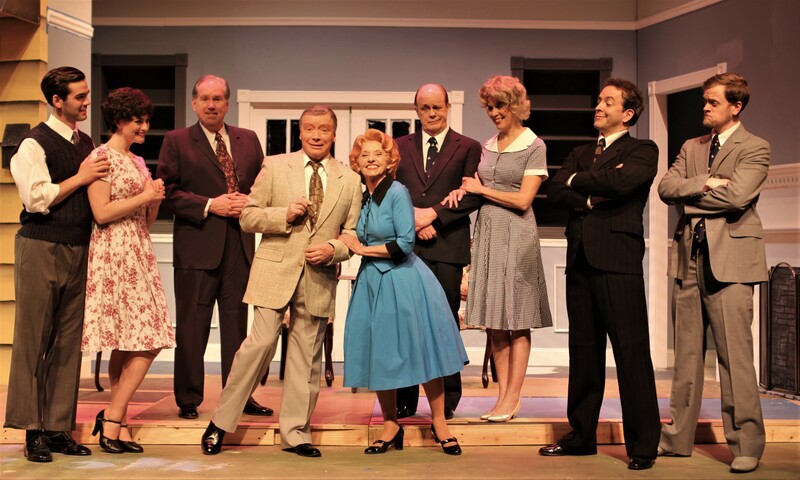 Blanche (Sarah Knapp) and Harry Morton (John Swanson), Semina De Laurentis as Gracie, R. Bruce Connelly as George and Tom Chute as Harry Von Zell. 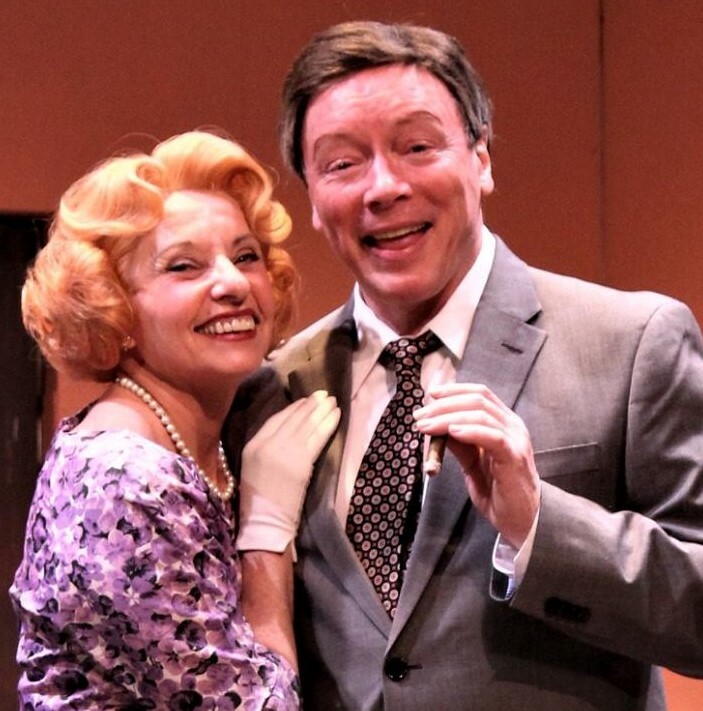 Let me clearly state from the beginning of this review- Seven Angels Theater has done an absolutely remarkable job in recreating the Television world that George and Gracie inhabited. The sets, props, cigars, clothing and the wigs are amazingly correct- yes both George and Gracie wore ahem- wigs! Even that darn hat closet is there, filled with hats that Gracie forgot to give back. If you didn’t know better one would have thought you had literally walked through the tube of your old Zenith and stepped into the “real life” world and home of Burns and Allen. Though originally broadcast in black and white, yet for your viewing pleasure Seven Angels presents the George and Gracie Show part two in living color and not commercial free. By the way, those lucky enough to sit in the front few aisles may be recipients of “Carnation’s Famous Pumpkin Pie Recipe” – the shows sponsor – ahem – I got mine!! Major Kudos first to R. Bruce Connelly in recreating gravely voiced professional straight man George Burns. Sir you were a delight- what a merry twinkle in your eyes throughout. Hands down you were George, from a perfect pursing of your lips to the use of the prop cigar. Now let me tell you – the “STAR” of this show is none other than SEMINA DE LAURENTIS and she knows it!! De Laurentis is incandescent as Gracie- absolutely radiant in recreating Gracie, right down from her two toned wig, befuddled laugh, and quick delivery of script. Miss De Laurentis is having as much fun on stage as we are in watching her. Shame on you though for making me tear up at every nuance of you being Gracie- but I loved it! 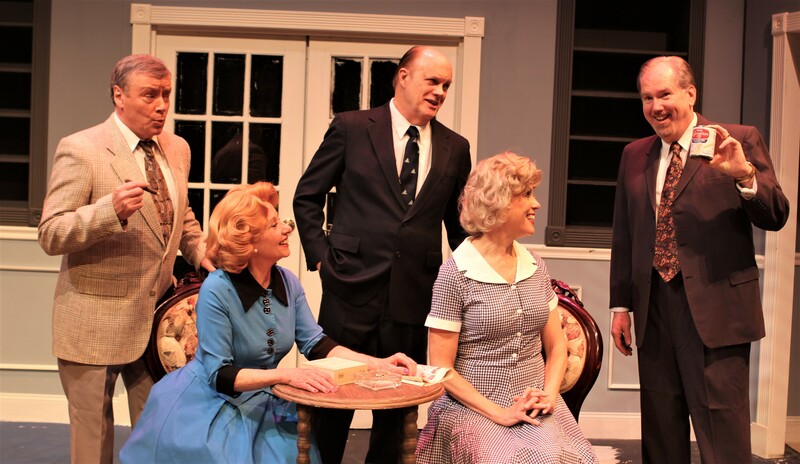 Major kudos to the rest of the cast as well including Sarah Kanapp as Blanche, John Swanson as Harry, and the one, the only Tom Chute as Harry Von Zell. The production has its heart in the right place – full and lovely effect- we are transformed. I truly hope families bring their children to witness this outstanding homage to the golden age of television. Indeed when comedy was king and a woman first ran for President – it’s true Gracie once indeed ran for the POTUS, we may have loved Lucy but we definitely cherished Gracie- say not “Goodnight Gracie” but hello to the charms of this wonderfully creative reconstruction of a hit television program. 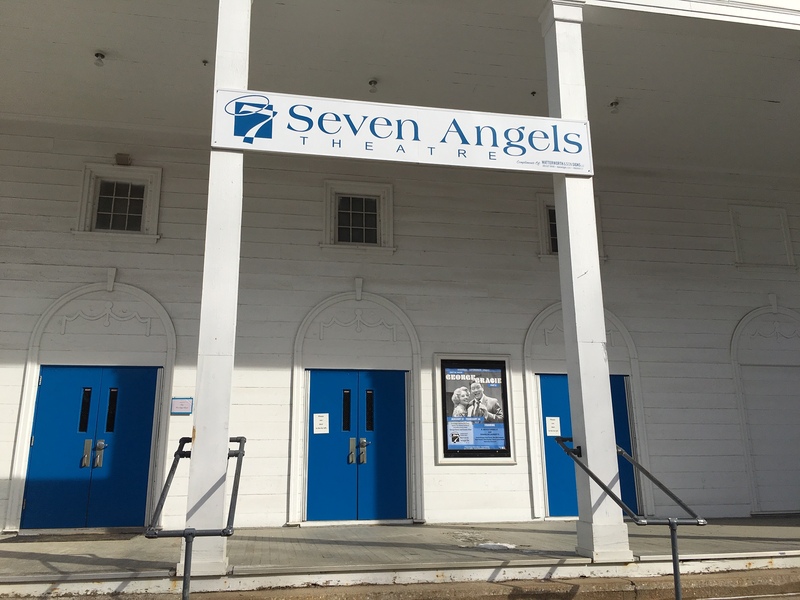 Bravo to Seven Angels, and a big hug to the Angel’s extraordinary talented Miss De Laurentis. Enjoy! 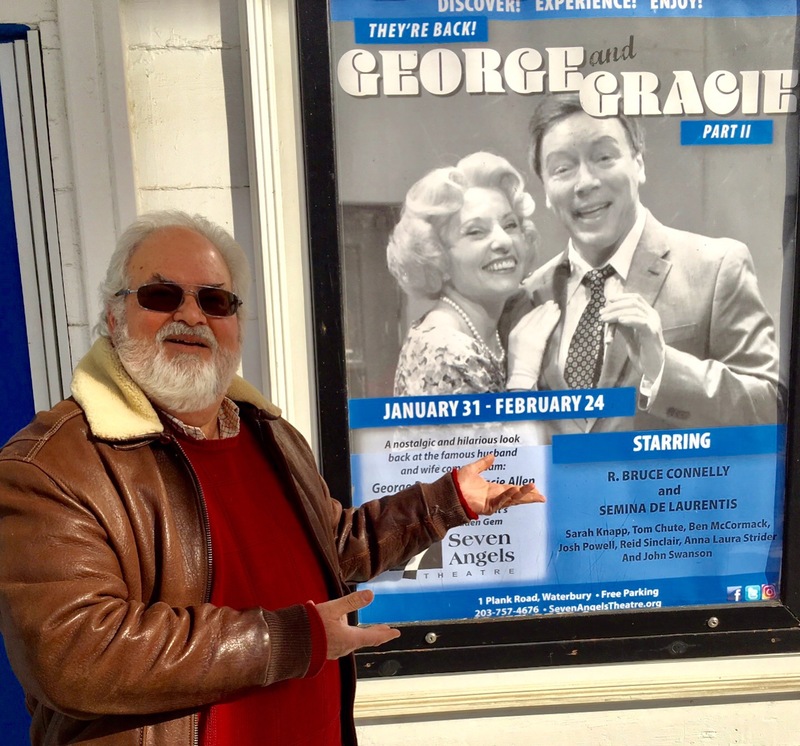 “George and Gracie, Part 2“ is currently being produced at Seven Angels Theater. For tickets call the box office at 203-757-4676, online at SevenAngelsTheatre.org, or at the box office at 1 Plank Road, Waterbury. Free Parking. Just off I-84. GPS directions use: Hamilton Park, Waterbury. This entry was posted in Howard, Howard Steven Frydman, Lovers, Movies, The Howard, Theater, Uncategorized and tagged Burns and Allen, George and Gracie: Part 2, George Burns, Gracie Allen, Howard Steven Frydman, plays Theater, Semina De Laurentis, Seven Angels Theater, The Howard, theater reviews. Bookmark the permalink.